Dr. Jason Fowler holds a bachelor’s degree in biology from Centenary College in Louisiana (2002) and a Doctor of Dental Surgery degree from the University of Texas Dental School in San Antonio, Texas (2006). In addition, he completed a two-year program at the Center for Aesthetic Restorative Dentistry to further develop his skills in the specific areas of aesthetic and complex restorative dentistry. 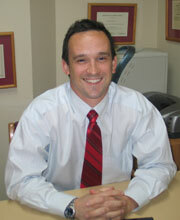 He also continues to serve at the Center for Aesthetic Restorative Dentistry as an active teaching faculty member. Dr. Fowler’s passion in the Fort Worth dentistry field is to educate and inform his patients of their oral health needs and to assist them as they not only achieve excellent dental health, but also reach their aesthetic goals. Whether that involves a simple teeth whitening or complex dental restorations made necessary by injury or destructive disease, Dr. Fowler’s experience allows him to provide necessary care by blending aesthetics and function to return his patients’ smile to their former healthy state. His extensive training in aesthetic and restorative dentistry has made him a leader in the field and earned him distinguished recognition locally in Fort Worth as well as at the state and national level. 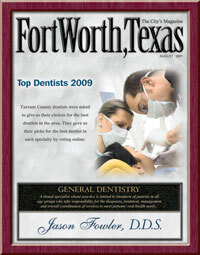 He is routinely recognized by his peers as one of Fort Worth’s Top Dentists in Fort Worth Magazine. He has been named a Texas Super Dentist every year since 2013 and has been recognized multiple times as one of America’s Most Honored Professionals. His faith and his love for God and his family are the driving forces in Dr. Fowler’s life, whether he is working in the dental office or outside it. Dr. Fowler and his beautiful wife, Sarah, are blessed with four children and are actively involved with Christ Chapel Bible Church and their Home Group.